Cleaning your face is an essential beauty ritual and the first step to a radiant complexion. Discover the right reflexes you need to have to ensure perfect cleansing according to your skin type! Acneic skin: beware of stress! If the proliferation of acne tends to make those who suffer from it feel depressed, the opposite also seems to be true: scientists now agree that stress can have an aggravating effect on acne. To help make your skin clear again, try relaxing! To preserve the radiance of your skin and delay the effects of time, nothing beats a healthy lifestyle free from excesses! Indeed, beyond your daily skin care routine and choice of your cosmetics, your lifestyle is a key factor for the beauty of your skin. Because your skin renews itself continuously, it needs suitable nourishment to stay in good health: vitamins, trace-elements and essential fatty acids contribute in their own way to preserving its youth and radiance. 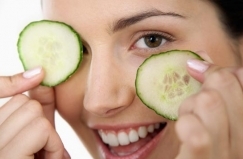 Learn how to make your diet the first part of your beauty routine for your skin!